"Are we programmed to think that holidays should be taken with someone else? " This was a text from a close friend. Although she’d found a great deal I had to decline due to another holiday which was around the same time. My friend, undeterred, booked the holiday and decided to go it alone. I felt a sense of pride and was totally inspired but when I shared this story with others many shuddered at the thought. Remarks such as: ‘isn’t she scared?’ or ‘she needs to be careful’ or ‘won’t she be lonely?’ came in quick succession. It’s unfortunate that we are still living in a time where we immediately think ‘danger’ when we think of a woman solo travelling. I’m not sure the first two comments would have been thrown about as much if my friend had been male. This also seems to be the case for a female if she does anything on her own in this country. You’re going somewhere alone – a restaurant, the cinema, a bar? Madness! I would also be a liar if I said that some of these thoughts hadn’t crossed my mind when I went travelling six years ago. In 2011, my friend and I decided to don our backpacks and embark on an adventure across South America. Although we were going to be together we still had to endure comments and advice from fearful friends, colleagues and relatives. So much so that I took to the internet to see if there were other females who had been away from their home town and lived to tell the tale. The internet was awash with articles and blogs from women who’d travelled, and my mind was put at rest. But – as my friend’s mum said, “you can’t always believe what you read online”. To put our families at ease we booked a tour for the first week of our travels and provided our itinerary along with the contact details, a photo and most probably the fingerprints of the Tour Guide we had booked with. Panic slightly decreased we were able to enjoy the build-up to our trip. When we arrived in Brazil we immediately noticed that, as a pair, we were the odd ones out. Our group was made up of solo travellers – male and female. As we travelled from hostel to hostel, country to country, this kept happening time and time again. So many people were travelling solo! When my friend decided to head back to England after five months, there wasn’t even a decision to be made, I was going to continue my travels - alone. I did another ten months and it was a truly remarkable and unforgettable experience. There were times that I wished I could share some of the memories with my close friends and times when I did feel lonely, there was even a time when I was slightly frightened for my safety. When I look back now, all I think about are the good times which were in abundance. So it came as a surprise to me that the past month I have been overthinking booking a holiday on my own and all the fears started to circulate around my head. Where is safe to go? Will I attract unwanted attention? Will I be bored of my own company? I took to the internet and stumbled across a blog post which would add fear to even the most confident of women. In a nutshell, it said: if you’re a woman travelling on your own don’t drink, don’t look at anyone, don’t go to bars, don’t stay out past 7pm – don’t…don’t…don’t! Feeling like I had just had the parents rule book for teenage girls thrown at me, I almost cancelled my annual leave. Instead I chose to interview my friend and get her feedback from her solo jaunt to Barcelona. Having not had a holiday for a year and recently single, my 30 something friend contacted her only two single friends (yup – that included me) and asked if they wanted to join her. With the answer being no, she realised she had two options. Not go on holiday or go it alone. She of course chose the latter. Are we programmed to think that holidays should be taken with someone else? She had a word with herself and decided to take action, this meant looking into what activities were taking place whilst she was there. The next day she booked onto a coastal walk. Expecting to find couples she was surprised to find that everyone there was travelling on their own and the women outnumbered the men. She told me that she would 100% go on holiday alone again. Although there were times she wished she were with friends and a few times of solitude. She realised that if she hadn’t been solo she would have had a totally different experience and missed out on attending a Bob Marley tribute band on her birthday and meeting some of the people that she did. Speaking with her helped me get out of my own way and I finally booked my trip. Yes, I’ll be eating in restaurants on my own, refraining from going clubbing and will have to accept that most of my photos will be selfies – oh look, there’s my head at the beach/the church/the museum! But, I will get to have a holiday on my own terms. Which is to write, read and relax with a little exploring thrown into the mix. 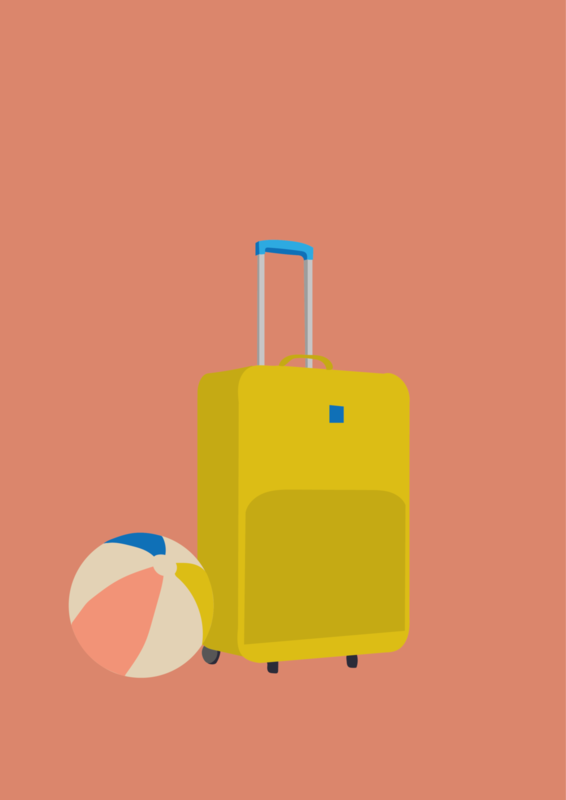 My friend and I are not the only ones, statistics have shown there has been a significant rise in the number of people that go on holiday on their own. The ABTA 2016 Consumer Survey Holiday Habits Survey (UK) reported that 13% of the 1962 surveyed took a holiday on their own last year. The reasons to do so were varied but the most common answer was ‘the opportunity to do what I want’ with 79% of the people stating this. I absolutely love this response as to me it highlights that people have started to value their free time. I’m sure we’ve all been on a holiday where we’ve either bitten our tongue and did something we didn’t want to or on the flip side, we dragged people to do something they didn’t want to which led to feeling anxious or awkward the entire time. · Accept that as you’re travelling solo you’ll have a different experience to what you would if you were going with someone. · Use common sense – which should be used anywhere. I live in London and scary things can happen here too. Criminals don’t just live abroad. · Understand that when people express their concern they are looking out for you. Keep them updated on how you are and let someone know where you’re staying. · If the fear of being on your own is too much but you really want to go on holiday book group tours/excursions. Stay in a hostel or with a female Airbnb host who has great reviews. · Book a holiday in a destination that you’ve been to before so you’re familiar with the area. · Stay in an area that has a lot of tourists and near a good transport route so you don’t have far to get back to where you’re staying. · If the idea of a holiday on your own is still too much, start slowly by being a tourist closer to home. Go to the cinema, the theatre, a gig, have a day trip to another city and see how you feel after that. I know that my confidence will soar after my solo holiday and that will inspire me to do other things in my life that I’ve been putting off, as it did when I came back from my travels in 2012. Imagine if more women decided to push past their fears and take that holiday – I really believe a shift would happen. Tempted? Why wait. Acts of self-sabotage: do you feel like a workplace fraud?